A G-TEC Torch Booster boosts utility natural gas up to 15 psi for quick cutting, heating, bending and many other shop jobs. Turn the Torch Booster on in the morning and forget it! When you light a torch you get a steady gas supply, when no torches are lit the system automatically puts itself into recirculation mode - turn it off when you go home at night. 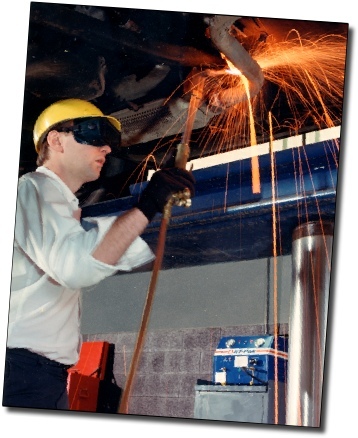 G-TEC has systems like the TB-30 Torch Booster for smaller shops and larger capacity systems for shops with many torches. 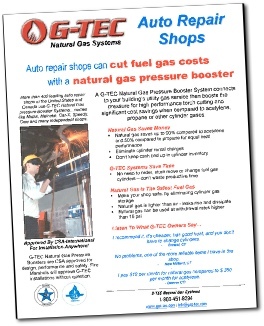 Click on the brochure to download it and find out more about the benefits of high-pressure natural gas in auto repair shops! to order, store, move and change! 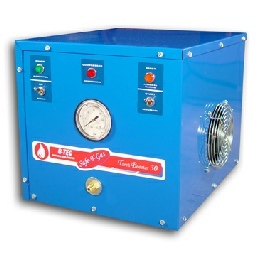 TB-30 Torch Booster connects to the shop utility gas pipe and raises pressure as high as 25 psi for torch cutting. Most shops install a regulator to set pressure at 15 psi - TB-30 connects to the shop manifold to deliver high pressure gas to all bays. TB-30 is economical and supports one active torch at a time- start TB-30 in the morning and turn it off at night. TB-30 automatically adjusts as torches are turned on and off. It’s one of the more reliable things I have in my shop! to move or change and he never runs out of gas!